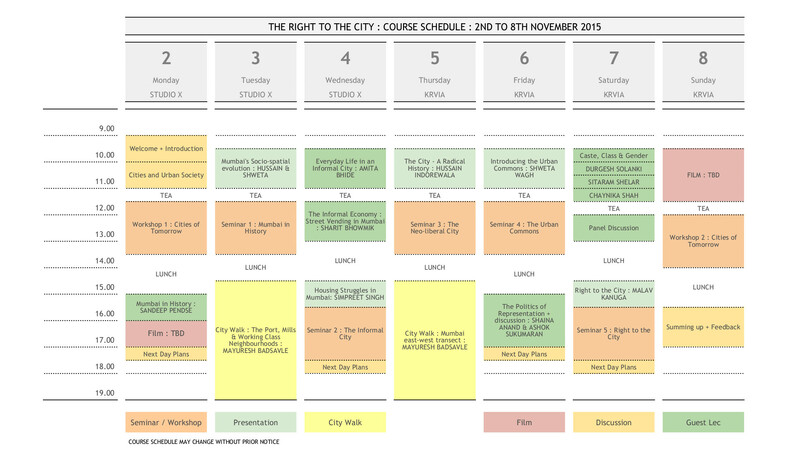 The RIGHT TO THE CITY Course is an initiative to explore the concept, practice and possibilities of the Right to The City framework. Rooted in the history and socio-spatial development of the city of Mumbai, it will seek to understand how social movements have always claimed their right to the city, to resist, to create new imaginations and practical alternatives for urban life, based on solidarity and mutual aid. The program will also explore the origins and nature of urban struggles around the world, and explore the scope and scale of the movement towards the building of democratic, egalitarian and environmentally just cities. The program will include city walks, seminars, presentations and conversations – and is open students, researchers, activists, and anyone who is interested in these, and related questions. Read or download more information here. The course will include presentations, guest lectures, seminars, film screenings and city walks. Each day will begin with a presentation that will set up the seminar and subsequent sessions. Take a look at the schedule here.